The Last Damned Healthcare Article You'll Ever Need! What is the moral of this story? Anybody who thinks that being greedy will make you rich, is an idiot. Let's start with a simple, but relevant question. Why does the average eighteen-year-old male pay more for auto insurance than a female of the same age? Does anyone really need to answer that question? It’s well known that men, until about the age of twenty-five, are far more likely to get in an accident than women of the same age—about eighteen million times more per year. But even well into their golden years men cause more accidents than women. They’re also more likely to get in the car hammered drunk and drive. In other words, their behavior, which is a good deal more conducive to getting killed in just about every kind of wheeled conveyance, is the difference, and that is why they pay significantly higher premiums. Imagine if that same behavior had no effect on cost. And, that it was no longer legal to discriminate against young men for driving just because they were a lot more likely to kill or be killed behind the wheel. Would anyone see this as reasonable? What if politicians began succumbing to the pressure of heavily organized groups of eighteen- and nineteen-year-old males, armed with slogans like “You want me to kill some kid with a gun in Iraq, but I can’t kill them in the good ole USA while driving drunk?” Before you know it, college kids from Berkeley to your local community college would be marching in the streets with signs that said, “Fair treatment regardless of gender.” What could be more American than that! If this seems farfetched, it isn’t. The same illogic that applies in our hypothetical scenario is at work in our current healthcare debate. Here’s a simple example. Health insurance is more expensive if you’re older, a good deal more expensive when comparing a sixty-year-old to someone who’s twenty-five. In that regard, youth is a big advantage--and for obvious reasons. Young people are more likely to pay much lower premiums because they’re a lot less likely to get sick. They’re also more prone to forego shelling out their hard-earned money for expensive insurance premiums for the same reason. Why take $500.00 dollars a month out of your pocket to buy insurance you’ll probably never use? Here’s the rub. Young people do get sick and need medical treatment. And, some get into car accidents and survive, but not without heavy medical costs, to say nothing of other unforeseen calamities. Without health insurance, every other taxpayer is forced to pick up the bill for these youthful slackers. The fact that the average young person is probably more likely to be killed by a wild boar than incur huge hospital bills is beside the point. That is the equivalent of America’s current healthcare debate. Once you start talking about why some folks have coverage and others don’t, using terms like “intrinsic fairness,” you’ll have little hope of untangling the truth from the rhetoric—and there is nothing that politicians love more than soaring rhetoric. Without lofty verbiage echoing throughout the halls of Congress and across television screens, “Reason,” that most disputatious of tendencies, could get in the way. Rhetoric is always the last refuge of scoundrels of every kind, politicians and televangelists being fine examples, with little appreciable difference between the two. So, how do you cover everyone regardless of behavior or circumstance? “Not easily”! Certainly not without a radical increase in costs. In fact, no reasonable business would risk substantial losses unless they were offset by even more substantial premiums. In other words, no one goes into business with the intention of losing money—not if they wish to stay in business. Of course, government isn't a business, so losing money isn't much of a problem. Not as long as your well-intended Uncle Sam can simply stick his hand in your pocket to pay for his failed ideas. Why be accountable when the tax payers make such willing scapegoats? In all fairness, though, there are people who get sick through no fault of their own, and any culture that simply lets people rot in the hospital doorway is no culture at all. I think that few would disagree with this. Children, the aged and the infirm should be taken care of with undiminished capacity, whether they can pay or not. The problem, of course, is finding the most cost-effective way of achieving that goal without breaking the bank. Throughout most of American history, charity hospitals took care of the poor. These weren’t Soviet-style hovels with nurses wearing babushkas and patients groveling in filth, but were among the premier hospitals in the world—often run by churches. Catholics were prolific in building hospitals for the poor. Protestants weren't far behind. Strangely, there were no atheist’s hospitals, not a single one. It was those evil Christians who overwhelmingly built hospitals, nursing homes and soup kitchens. In fact, they were at the forefront of virtually every charity movement. They still are today. Let’s be fair, though, back in the day, atheists were busily engaged in their own religion, with Darwinism having begotten the eugenics movement and religious figures like Margret Sanger (the Anti-Mother Theresa) eagerly aiding the poor by snipping their reproductive organs. This was intended to thrust forward the human race by drying up the supply of racially inferior peoples from around the world, especially the dark-skinned ones. “The less idiots the better.” being the favored slogan among social progressives following Darwin’s triumph over religious superstition. But, I digress! Before there were runaway hospital costs and doctors stopped making house calls, sick folk paid as best they could. Doctors got paid much lower wages, relatively speaking, and an aspirin wasn’t twenty dollars at the emergency room, which it can easily be in today’s government-subsidized environment. Costs, overall, remained stable. It wasn’t until Uncle Sam got deeply involved in the healthcare business that prices began to soar like the proverbial eagle. So, what did happen to cause greed (I mean prices) to rise like the stench from a fresh mound of dog debris? Back in the good ole WWII, Franklin Roosevelt, the president at the time, determined that, in order to keep workers from using the threat of labor strikes to bargain for better wages during wartime, he’d offer them subsidized healthcare. It costs money and labor to build weapons of mass destruction. Funding for scientists so they could devise bombs that could kill every living thing on earth wasn’t cheap either. It was simply easier to offer big tax breaks for businesses so their employees could get cheap healthcare in lieu of a raise. Here’s how it worked. For every dollar spent by employers on their workers’ healthcare, the government gave the business $1.50 to $2.50 in tax breaks. This was more than good for America’s vast manufacturing industries and insurance companies, it was highly profitable. Up to that point people paid very modest fees for doctors and hospital visits and prices remained stable. Even afterward prices rose at acceptable levels. Part of the reason was simple. As WWII came to an end America emerged largely unscathed from the global carnage. Europe and Japan, by comparison, were little more than rubble, and were in need of a big hand up, which Americans generously offered. It can be expensive to fight two global wars in the span of forty years without a staggering loss of life and property, as Europeans, in fact, did. Being the sophisticates that they are and always eager to try some new political ideology, they gave the thumbs up to National Socialism (Hitler and the Nazi’s). As if that wasn’t enough, some of them came up with the equally compelling Marxist utopia of international communism—and forged ahead running up a death toll unmatched in human history. So, when things got really bad, they called on Uncle Sam in an effort to end the mass slaughter and help them rebuild after the war. This meant that America, which was already the most powerful industrialized nation on earth, was pretty well set with a huge client base for its products. Jobs and more jobs sprung up, driving our economy and creating incredible national wealth, even for the poorest people, including African Americans. The rising tide, not unexpectedly, lifted all boats. Eventually, those pesky Europeans and Japanese rebuilt their countries and economies and began to compete with Americans in the global marketplace. It was at this point that America had two options; let them compete fairly, or bomb them back into a state of permanent need. As appealing as the second option was, we chose the former. Europe and Japan recovered and America’s period of unparalleled prosperity came to an end, as it always does. It was just about that time that we decided to radically increase the size of our welfare state in an attempt to end poverty permanently. After all, we were rolling in dough, what better time, if not then. The fact that we had largely ended poverty by creating jobs and freedom, was beside the point. Throw in an ever-growing military industrial complex, and, before you know it, you’re running up debts like a fourteen-year-old with a no-limit credit card. By 1970, with the creation of Medicare and Medicaid and with the expansion of the welfare state in full swing, our healthcare costs began to rise like a rocket ship sucked in by the gravitational pull of the sun. A simple look at a chart showing the explosive rise in healthcare costs after the 1960s makes it clear that it wasn’t greedy doctors or insurance companies that was the problem, but the attempt by the government to radically expand subsidized coverage for the poor and elderly that was the difference. Healthcare, however, wasn’t the only thing that made Aerial flights into the stratosphere. "From 1900 through the 1940's the amount spent by government on health care rose less than one half of one percent. After WWII, costs doubled. By the 1960's, after the establishment of Medicare and Medicaid, healthcare costs rose nearly thirty times. These numbers are based on Gross Domestic Product and are taking into account inflation"
"In 1913, the 16th Amendment to the constitution made the income tax a permanent fixture in the U.S.. 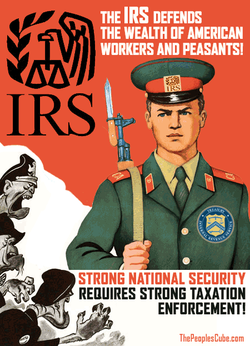 In 1918, collections for the IRS passed the billion-dollar mark, rising to $5.4 billion by 1920. With World War II, employment increased, and so did taxes, to the tune of $7.3 billion. The withholding tax on wages was introduced in 1943 and radically increased the number of tax slaves...I mean taxpayers, to 60 million and tax collections to $43 billion by 1945." Prior to WWII the income tax, which had been minimal, began to hit workers across the board for ever larger sums in an effort to pay for it all. That meant that workers were, in reality, paying for their own healthcare, just not directly. As long as the withholding tax came off the top and was hidden behind specially-devised terms like “before taxes" and "after taxes” (and no one looked too closely), all was swell. The income tax, among other encroaching taxes, would continue to grow like a festering sore as the nation’s wealth increased—and government grew exponentially with it. All of this expansion created a circular problem, more services and entitlements meant more government, which, in turn, meant more taxes. Politicians found out pretty quickly that they could buy elections by pandering to particular segments of the population by offering new and amazing programs that could be paid for with good intentions and other mystical processes. And, amazingly, the people bought it, particularly those designated as the prime beneficiaries of the government’s second hand generosity. When things got bad and money got tight, the finger could be pointed at some undesirable group like the rich and words like “Greed” could be used to elicit the appropriate emotional response. In reality, it wasn’t those greedy insurance companies and drug manufacturers that were the real problem, although they made their own contributions, it was an ever-expanding sense of entitlement that drove it all. A sense of entitlement that filtered across the land, with poor and rich folk alike, hands out, palms up, and a “grab everything you can” theory of good citizenship that was the real culprit. There was a secondary and unintended consequence at work as well. Once a person’s insurance picked up the tab for medical care and doctor’s visits, who cared what things cost. After all, their insurance would pay for it, so why worry. By disconnecting healthcare from market forces and genuine competition there wasn’t much to restrain prices except the altruism of businessmen and politicians. And altruism amongst the business classes is only slightly less likely than your average politician’s indifference to being reelected. This was crony-capitalism personified, even it was initially motivated by good intentions. That’s why an aspirin at the emergency room today can cost as much as $20.00, while you can by a bottle of thirty aspirin for a buck at your local dollar store. The difference is the dollar store isn’t regulated by the government, so competition drives the market price. If they were subsidized by the government, it would be called the twenty-dollar store. Why then, would any rational society hand over a trillion-dollar-a-year industry, solely to government (Which is the ultimate intenion) when it’s that same government-subsidized healthcare industry that is driving all the debt to begin with? The answer is simple. If we removed all government subsidies from the equation, our radically over-inflated healthcare industry would collapse like a punctured balloon. The rapid dispelling of oxygen would cause it to careen out of control and fall earthward, taking the nation with it. Since that’s unthinkable, especially to politicians who understand the political ramifications of it all, the only alternative will be to turn it over to the government. They will be forced to set prices for goods and services and eliminate the market completely in the hopes that the great runaway beast can be restrained, leaving only a monopoly in its place. It should be obvious that a healthcare version of the old “Bell Telephone” model is a bad idea. But I have little confidence that reason alone will be sufficient to pierce the veil. It’s far more likely that an eventual and unprecedented economic collapse will be the catalyst for meaningful change. America the great, has become a nation of junkies and crack addicts, with government as the dealer and debt as the drug of choice. Contrary to popular mythology, our healthcare system, in its previous incarnation, wasn’t some greedfest of corporate fiends withholding medical treatment while urchins fell like flies on American streets. Sure, mortality rates were higher, but not because of a lack of government intervention. Technological and scientific advances made the world a better place. You see, scientists don’t just build bombs—and Christians aren’t always withholding a sandwich from the poor until they get an earful about Jesus. The world is, and always has been, a more complex place than the simple-minded way in which our political history is conveyed through the lens of popular media. If a “Keep it simple, stupid” methodology is at work within in our culture, it only works because stupidity, willful or otherwise, is always an easy substitute for actual knowledge. And, until we’re willing to look beyond the spiraling rhetoric, it’s unlikely that we’ll get very far in solving our biggest problems. We’ll remain captive to our well-intended ignorance, using selective facts as weapons to move forward what is often nothing more than self-serving agendas—always, of course, masquerading as the noble cause. The extraordinary George C. Scott, speaking the words of the equally extraordinary Paddy Chayefsky, in 1971's "The Hospital."